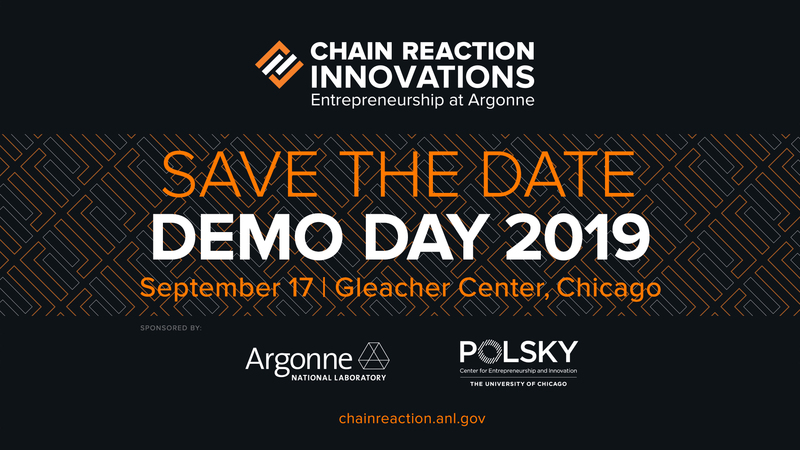 September 17, 2019 5:00 p.m. to 8:30 p.m.
Chain Reaction Innovations, the Entrepreneurship Program at Argonne National Laboratory, will be holding Demo Day 2019 from 5:00 p.m. to 8:30 p.m. on September 17, 2019 at the Gleacher Center in Chicago. Six teams from Chain Reaction Innovations Cohort 2 will be showcasing their technologies and emerging companies to potential investors and the energy community. CRI is the Midwest’s first entrepreneurship program to embed innovators in a national laboratory. Check out highlights from CRI’s first Demo Day 2018, held last September. Chain Reaction Innovations is a two-year program for entrepreneurs focusing on energy and science technologies. Selected annually through an application call, the program enables innovators to work on their technology full-time, reduce R&D time, and de-risk technologies with the help of leading experts and equipment from a national laboratory. Each cohort works to build their innovations into market-ready businesses. CRI is located at Argonne and supported by area mentors from the Polsky Center for Entrepreneurship and Innovation at the University of Chicago, mHUB and the Purdue Foundry at Purdue University. Chain Reaction Innovations is part of the Lab-Embedded Entrepreneurship Programs from the U.S. Department of Energy’s Office of Energy Efficiency and Renewable Energy (EERE). EERE created the Lab-Embedded Entrepreneurship Programs to provide an institutional home for innovative postdoctoral researchers to build their research into products and train to be entrepreneurs. The program is funded by EERE’s Advanced Manufacturing Office (AMO).